The move to the open scoring system has generated a number of serious complaints, one of which is that gymnasts are suffering more injuries. 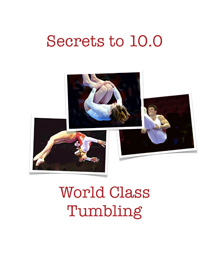 Gymnastics coaches have much they could learn from T&T tumbling coaches, who produce the best tumblers in the world. Here are some training ideas to steal. Suggested mats for home equipment, but suggest putting the money into more gym time instead of home equipment, which is often underutilized or outgrown. Coach Howard advises a parent on what to look for in gymnastics mats for a home gym, but warns that their money may be better spent in other ways. Diving overhead safety spotting system discussion with videos of flying ring dismounts.